I've been working with this new Hometown Summer line by Pink Paislee this week and I can't even tell you how much it's making me long for summer. I love the bright colors and fun icons in this line. It was perfect for scrapping these pictures from last summer. I remember that it was the first time that all 3 of the kids were brave enough to jump into the pool. And they did that over and over and over. It's amazing how they never get tired of it. Naturally, it comes with the screaming "look at me, look at me, take my picture." So I knew I had to get the story down on a page. I was inspired by a home decor piece I spotted on kreyv.com that had a jumble of letters falling all over a frame. I used the same concept to make my title a little more interesting. I like how the letters are literally “jumping in” to the page. I used white embroidery floss to add a bounce line and a place to ground the title. I placed the letter stickers on pop dots so that they would stand out from the busy red background. I cut up the wave patterned paper to make a wide border for my page. I added several overlapping layers and inked the edges with a light brown stamp pad for dimension. This was such a fun, bright page to make. 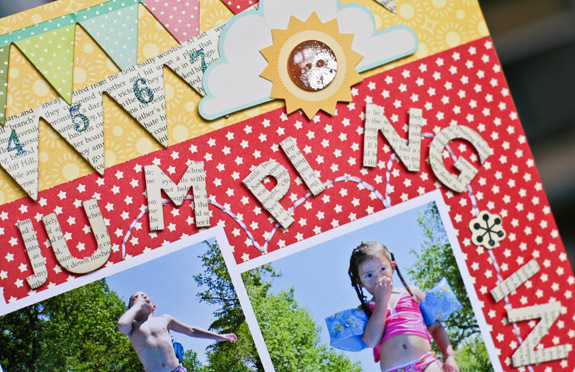 Summertime memories and pages are my favorite things to scrap. I look forward to the coming season. I just finished editing my first video and will be posting it on Monday. Hope you like it! I had a lot of fun playing with Emma's Shoppe by Crate Paper this week. It's pretty unusual for me to make "pink, girly" pages, but every once in a while I have a story about my niece and I get to indulge in more feminine styles. To tell you the truth, it was hard! I'm not sure I achieved the exact look I was going for, but I guess this is as girly as I get. The page is about my niece and how I love to indulge in buying her outfits and matching accessories. She gets so excited every time she sees me with a bag from Gymboree. It's funny how she can't read, but she knows that logo. I've included a picture of her as a newborn in the very first denim Gap dress that I bought her and then some current pictures from this past summer. My favorite part of the layout is this spool of thread. I made it out of a journaling sticker from Crate's Family Portrait line. The shape reminded me of a spool. I wound the yellow string around the sticker and then added the buttons and pin. I tried to highlight the clothes theme with the size sticker, buttons, spool end stickers and fabric trim. This was fun and pink and girly, but I'm ready to return to the wonderful world of BOYS! I just posted this layout in the Two Peas in a Bucket.com garden this morning. I love this Fine and Dandy line from My Mind's Eye and couldn't wait to use it. I've had these pictures and story in my journal for a while now. When I saw that the colors matched the line, I knew just what I was going to do. I love these pictures taken at my nephew's birthday party this year. Nico and Mario are quite the pair. Mario has the ideas and Nico's not afraid to carry out the dastardly plans. It makes for a very mischievous pair! They also love to do silly things to make each other laugh. And then it dawned on me that my Uncle, male cousins, my Dad and my grandfather are all exactly the same way. All a little crazy, love to laugh and when you get them together - watch out! This picture of my Uncle (who should know better) getting the boys to "pose", was perfect for my story. The big yellow banner is part of the My Mind's Eye chipboard shaped album. It was the perfect place for the long title and and some embellishments. 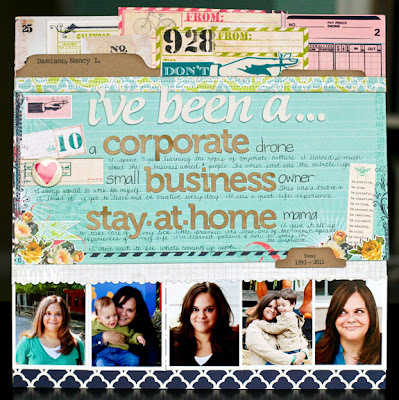 I love using pages from a premade album like this because they add great texture and all the hard work is done for me. I love these fabric letter stickers from Prima, but I will warn you - the adhesive on them is not so great and you will end up having to apply glue to get them to stay. Bummer, but I still like them. For a complete look at the supplies that I used you can see them here. Thanks so much for stopping by my blog. I'll be back soon with a Cricut project! This is an old Christmas project that I did for the Cricut Circle. I made this home decor piece using a charm frame on the Heritage cartridge. When I put the frames together, I noticed that it created a really cool cathedral quilt effect. I added small photos from the Christmas cards we received the previous year and our family card up on top. 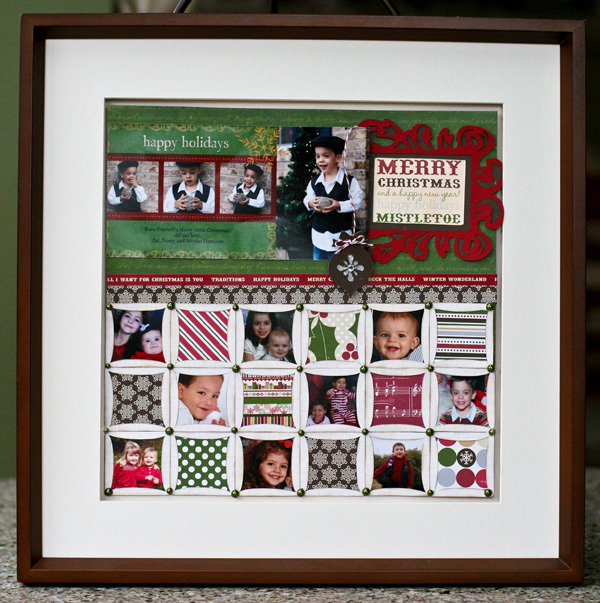 I love this project because I can pop out the page and put it in my scrapbook at the end of the Holiday season. And next year, I can just create another one. I'm still working on that video. It's not quite as easy as it looks! I just posted this page in the Two Peas in a Bucket Garden this morning. This is my final winter assignment and I can't tell you how happy I am about that. I am so done with winter and scrapping about it! I love these stitched calendar pages by Ki Memories and I used it to mark all of the snow days we had in January. I embellished each date by sewing a snowflake out of twine and writing down how much snow we got on that day. I added a ton of embellishments and bright colors just to cover up some of the "white" on this page. The gray I used is a true steel gray and not the purplish hue that it looks like here. Not sure why the photo turned out that way. I tied the two pages together by running the colorful measurement tape sticker through both pages and wrapping the Echo Park swirl sticker around it. A few simple 4x6 pictures from this winter and the layout is complete. It looks like we are finally done with snow and winter in New Jersey. And that's it - the FINAL winter page of 2011! I just posted this page over on the Pink Paislee blog this morning. My assignment was to journal a story and lucky for me, that's one of my favorite things to do. I made this page depicting the different stages and roles that I've played over the past two decades. I want Nico to know that Mama had this whole big life before he became my world. I added my own handwriting to the layout which is something I rarely do. But I think it's important and adds a personal touch. My favorite part of this layout is the top border. I made the file out of kraft cardstock and then layered bits and pieces from the Daily Junque Ephemera and Labels packs. It's like a collection of things we gather in our everyday life. Love that! I've got a busy decorating weekend ahead of me. I'll be back on Monday with a Two Peas in a Bucket project. I have an old Cricut Circle project to share with you today. I made these cookie pops with the Cricut Cake machine this past Christmas. Nico and I spent a Saturday morning in the kitchen rolling out fondant (very, very thinly) and trying out the Cricut Cake machine. He loved to watch it cut. Getting the super-thin fondant onto the cookies was tricky, but I think they came out pretty good. 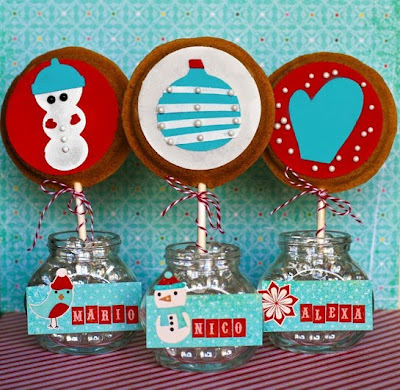 We made six different pops and then placed them in these glass jars from AC Moore. They were cute placeholders for our holiday dinner. The kids loved them, but be forewarned - placing a cookie pop in front of 5 year old and then serving a chicken dinner could be torturous (for the kids & the parents too!). 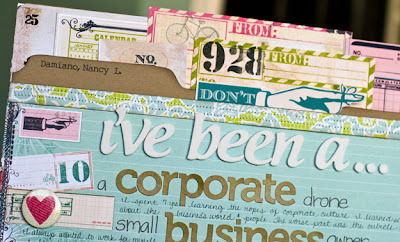 I've been working on taping a video of my scrapbook process. I hope to have it soon and look forward to sharing it with you! I have another Cricut Circle project to share with you! 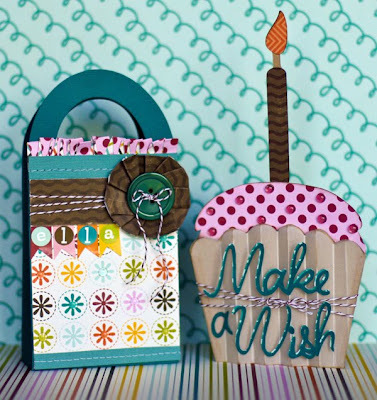 I made this coordinating gift bag and card with the Wrap it Up cartridge. and A Walk in the Park by Echo Park. This was super simple to put together. I added some clear dew drops and twine to both pieces for dimension and interest. The Wrap it Up cartridge has great baby, wedding and holiday cards that coordinate as well. We go to so many birthday parties throughout the year, it was handy to have this pre-made and ready to go! He walked into my bedroom this morning and told me, "Mama, take my picture - this is what cool looks like." And then he struck that pose. After I picked myself up off the floor, I took this picture for posterity. Because one day his girlfriend might want to see what "cool looks like." Note for Nico: A gold medallion (even a pirate one) and a shirt that's too small is never, ever a good look on a guy. xoxo Mama.